StarTip-Rift -- Tooltips from the Outer Rift. StarTip-Rift is is a tooltip addon. 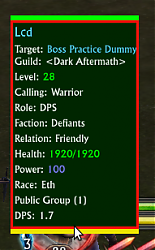 It only tries to reproduce the unit tooltip. You can customize by installing a new addon you write. Examples exist within the StarTip directory: StarTipDefault and StarTipNatural. You can copy/paste the entire folder to your Addons folder to get started. You'll have to give it a name though -- let's say HopeBound. Note that StarTip comes with two profiles: Default and Natural. If you wish to create your own profile using this profile as a template, then it's really easy. Check the file StarTipNatural.lua and adjust what you need to customize as you wish. Look under StarTip-Rift's Libs directory and note the LibScriptable-1.0 directory. Look under this directory, and you'll see LibScriptablePlugins-1.0. From there view all the various functions in the sub directories. This is your execution environment organized. The LibScriptablePluginUnit-1.0.lua file is where you might want to start. Each run environment for each Lua script executed has a couple of special members and variables. Such as _G if you wish to reach the overall script environment. And you have 'self'. And 'unit'. Then everything included from the plugin directory. Note that each instance of StarTip starts off with a _G, and that is the main script environment. However, we use a special table for each Lua script's environment, and _G doesn't point to that table, but rather to Rift's UI interface script environment, where Inspect.Unit.Detail exists.. So you could call '_G.StarTip:IterateModules()' or '_G.UI.CreateFrame()'. I've tried to add everything from Rift's _G into the user's Lua script's global environment, but I may have missed some things. This is what '_G' is for at this point. I'm always in #riftuidev on freenode.net, or use this addon's comments to ask questions. Bug fix. Users should be able to toggle animations now. - Update deprecated event hook. - Bug fix to screen clamping. - Change how we do clamping. May help with cpu usage. - Bug fix to Default profile. - Tag changes from LibScriptable to cache unit details. May lower CPU usage. - Bug fix. Try to address some "stuttering" someone complained about. - Allow configuring of animation settings individually. - Specify 'gravity' for SuperScope algorithm. Otherwise just provide the coordinates x and y from the TOPLEFT of UIParent. - GetFullWidth is now GetWidth as the former is deprecated now. - Stop using ResizeTo* functions since they're going away. - Bug fixes to animations. - Bump version. Thanks to lXl for helping with color choices. - * New command: /startip dumpenv * It will dump StarTip's run environment. Specifically 'StarTip.core.environment'. * Modified colors on LibScriptable's end to use colorsafe colors. Thanks to Cairenn for the suggestion. - Change animationFrame to animatioBegin. It is called when you mouseover someone. - Move class/tag line above the target line. - Use StarTip.unit where needed. - Bug fix to screen clamping. Still not perfect as it stutters sometimes. - Break out of this loop just in case. - Provide an option to turn animations off. - Add an animation feature. - StarTip should now try to disable a line if it produces an error. The line will return once you reload the UI. - Give it a better description. - Give a way to turn off the entrance message. Bug fix to Natural profile. Should display correctly for the Natural profile. - The SimpleMeter line now shows the unit's most recent DPS score since mousing over the unit. -- It will lag before displaying more than zero. - Add an option to turn off the startup message. - Print some help info on login. Tells about `/startip` and `/startip profile Natural`. -- Made UnitTooltip's default text more descriptive. - Rename StarTip Natural to just Natural. - Startup with the tooltip hidden. BUg fix. Shouldn't crap out when SimpleMeter's not installed. - Use class color for target line. - Show class and lvl in target line. - Cosmetic changes. Seems to be a bug; Sometimes Level doesn't appear. - Make the Guild line in the Natural profile a pingpong scroller. - Copy the SimpleMeter line to the Natural profile. - Include credits to Jor. - Bug fixes and enhancements to SimpleMeter line. - Add a line to Default profile called SimpleMeter. Shows information about the latest encounter, using SimpleMeter information. Use InitializeProfile instead of InitializeAddon. InitializeAddon still exists. Profile support's available. Check under the '/startip' slash command for more info. You have two profiles -- Default and StarTip Natural. The idea is you can install your own addons and switch to that profile through slash commands. Your profile option will remain between UI reloads. You can now create separate little addons that depend on StarTip-Rift, and you provide a "profile" from there. Updating project Description to link to StarTip Natural, the first StarTip-Rift profile, which can be used as a template for new profiles. Fix the Faction line, and use Event.Mouse.Move instead of a refresh ticker when moving the tooltip with the mouse. - Add Faction and fix a couple of display bugs. - Update and bug fix. - Bug fix with StarTip<->Cursor compatibility. - Address the issue of cells mixing up. Should fix the issue where tooltip cells would reverse from top to bottom, causing bitter ugliness. - Change "OnEnable" to "OnStartup." - Bug fix. The saved variables table should exist now for fresh installs. - Add support for FooBar. Clicking the module simply opens StarTip's config dialog. - Make the tooltip a bit more opaque. - Hide StarTip from _G. - Add riftdocs to keep a local version history of API changes. - Position the moveme frame smarter so it reflects the last position instead of just re-centering on the screen. - Bug fix. Temporarily anchor tooltip cells to TOPLEFT of tooltip frame, adjusting vertically per line height. - Add port of Dongle, and provide first ability to save tooltip position. Needs work. - Dry coded saved variable support. - Basic mouse positioning, although without SVs. More to come. - Move :Hide's function to :FadeOut and make :Hide do what the name suggests as opposed to fading out. - Make use of the new field energyMax to account for rogue talent granting 20 extra energy points. - * Add core to StarTip global. * Add cast bar. - * Add a DPS line. For now it's "always shown" since it refreshes. - * Added a new script 'onMouseover' which is run when the 'mouseover' unit becomes available. - * Bug fixes. * Recycle text frames. - Bug fix. Show offline and afk times similar to Pitbull4/DogTag/LuaTexts. - Place braces around the guild line. - Colorize the level line based on difficulty. - Add /startip slash command. So far it just accepts one command: '/startip cpu', which dumps CPU usage stats. - Remove some stray lines. - * Bug fixes. * Implement fading. - * Give README some text. * Increase background opacity so it's more opaque. - * Add the background module. * Implement clamping. - * Color up name and target lines a bit. * Guild line will show 'Title' if it's an npc. - Give the name line some color. - Typo fix. Power/Energy/Mana should update now. - Use class power colors (default unit frame color) for mana bar. OK, I figured out there are two problems with the issue I posted and regardless of whether "Defailt" was meant to be Default or Detail the whole thing is deprecated as of patch 1.10 (maybe even 1.9) which leads me to ask if this is being updated still? - For 1.9, use Event.Unit.Detail.TitlePrefixName/TitleSuffixName instead. For 1.10, use Event.Unit.Detail.TitlePrefixId/TitleSuffixId, then use Inspect.Title.Detail() to look up the localized name. Error: Event Event.Unit.Detail.TitleSuffix is deprecated, the addon environment is not in compatibility mode, and LibScriptablePluginUnit_1_0 has an active hook (named Detail.TitleSuffix). My concern is this changed in 1.9 (if I'm reading the changelog right) and again in 1.10 and we're in 1.11 with 9 days to go until 2.0...which is why again I ask if this addon is being worked on still? Error: Event Event.Unit.Detail.TitleSuffix is deprecated, the addon environment is not in compatibility mode, and LibScriptablePluginUnit_1_0 has an active hook (named Defailt.TitleSuffix). I got a similar one also mentioning that "Defailt.TitleSuffix" (which I'm guessing is the culprit as I assume it was meant to be default) but it failed the whole copy to clipboard. Though it was probably due to how long I waited to use "Paste" lol. Hm, may just be duncing out, but where in the code can I tell it to position the tooltip to the bottom right of the cursor instead of centered on it? I need to get this to where I can set it to anchor to the bottom right corner of the tooltip window. How do I do that? Hey, would you be able to implement target player's prestige rank and have it display as a row in the tooltip? That would be really awesome and helpful. I assume it can be done through achievements, and I would suspect that cacheing other user's prestige ranks on a per-character-name basis would help lower achievement function calls and thus resource usage. Last edited by TimeBomb : 12-24-11 at 10:37 PM. I am not able to reproduce the second issue I had, either. 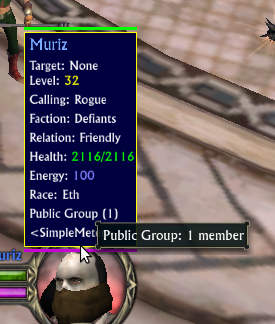 It was late and I was tired, so what may have happened is he got rid of his public group while I started to mouseover him, and I just never noticed, and thought it was a bug that the tooltip was hiding. I ran into something that may be what you're talking about; however it happens when StarTip is not loaded. Sometimes when I hover over that public group icon, the small public group tooltip will vanish and the real player tooltip will appear. I've noticed a couple minor-ish issues lately. I don't know if these have always been issues and I am just noticing them now, or if they are a recent-patch issue. 1) When I hover over a raid member on the left edge of my UI, half of the startip is cut off and lost in the edge of the screen. 2) When I hover over a target frame's public party icon - i.e. the button you can press to join someone's public party, the StarTip hides the hovering tooltip that normally shows you how many people are in the target's public party. 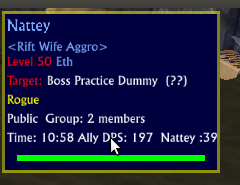 Overall, fantastic addon that keeps getting better. GJ. 1) Should be fixed in v1.2.9. I think. 2) I'm not able to reproduce this, unless I fixed it somehow without knowing it was broke. Rift frames should be above addon frames I think. This is what it looks like for me. Am I looking at the right thing? 1.2.9 did fix the first issue. Should be fixed in v1.2.5. Sorry for the trouble. Latest version: 1.2.4 has a major bug. The animations are bugged and the main StarTip window never shows when mousing over. Confirmed, getting same thing in 1.2.4. I upgraded to the latest version (1.1.11) and am receiving so many errors that I can't count them. I have gone back to 1.0.21-beta and the problems have been resolved. Most of the errors centered around a bunch of addons I don't have installed, like a damage meter mod. Should be fine in v1.1.12-beta. Sorry for the mishap.